Bagger Dave’s is the consummate burgers and beer restaurant. Bagger Dave’s prides itself on fresh, never frozen menu items. There are no freezers or microwave ovens in their kitchens. Even the fries are fresh-cut daily. And great food is just part of the story. It’s a relaxed, friendly place to meet friends, have a drink while watching the ball game, and enjoy a great meal. 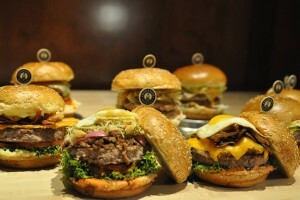 Bagger Dave’s menu offers a varied selection of burgers, sandwiches, and flatbreads as well as some Bagger Dave’s exclusives like their Prime Rib Recipe burgers, Amazingly Delicious Turkey Black Bean Chili, Handcrafted Artisan Mac ‘N’ Cheese, Sweet Potato Chips, signature cocktails, hand-crafted sodas and more.